FALLS CHURCH, Va. – Washington Capitals captain Alex Ovechkin stood inside the showroom at a local Honda dealer, a brand new Accord by his side. "Finally," he said, eliciting laughter from the crowd. Honda formally presented Ovechkin with the car Monday after he feverishly campaigned for one during the 2015 NHL All-Star Fantasy Draft presented by DraftKings on Jan. 23. It will be auctioned off, with the proceeds benefiting the American Special Hockey Association, funding grants for new teams, tournaments and camps. "This car will go to help special needs players throughout the United States," ASHA executive director David Lucia said. "Fifty cities, 30 teams and it will give them the dream to play the game of hockey. There are many barriers for our kids to play the game and the funding that will come from this raffle will all go to allowing these kids to play a great game. "They not only learn to play the game of hockey, but first and foremost, they learn life skills through the game that translate into everyday life for them." With help from agent David Abrutyn and the Capitals media relations department, Ovechkin quietly devised a plan at a Jan. 23 lunch meeting to win an Accord during the Fantasy Draft, awarded as a consolation prize to the last player selected. Ovechkin began lobbying, holding a handwritten plea in front of his face and commandeering backstage interviews. He barely missed accomplishing his goal when the team captained by Columbus Blue Jackets forward Nick Foligno picked him third-to-last. In a surprise twist, the last two remaining players, Edmonton Oilers forward Ryan Nugent-Hopkins and Nashville Predators forward Filip Forsberg, each received cars. "[As soon as I] was not top five, I started like thinking about maybe I have to go last and get a car," Ovechkin said. "It was fun. It was something new and for kids. It was pretty fun." Ovechkin's involvement with ASHA began in September, when three local teams joined him for a post-practice skate during training camp. There he met 10-year-old Ann Schaab, a member of the Washington Ice Dogs who asked him on a sushi date. Ovechkin invited Schaab and her family to a preseason game against the Carolina Hurricanes on Oct. 5 and the two dined on sushi afterwards. Schaab was at the dealership Monday, tagging along with Ovechkin when he conducted interviews. "He's my boyfriend," Schaab said. "He is, because I love him." 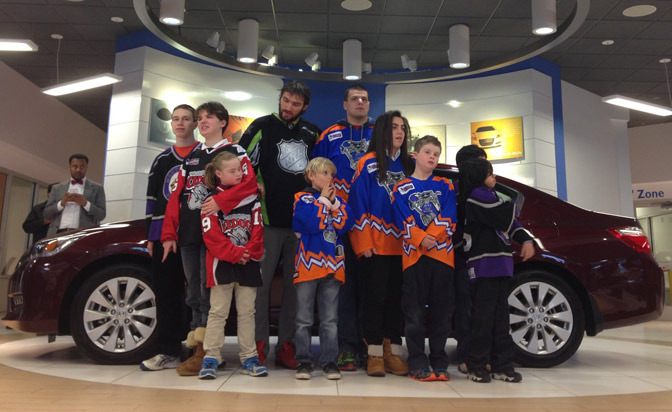 It is that bond with children like Schaab that motivated Ovechkin to win a car. "I've been in Washington almost 10 years," Ovechkin said. "I have [a] situation where I can help the kids. If somebody [has] a little bit to give away, you're going to be much happier and the people who are going to get it are going to be much happier as well."